An urban road authority planned to extend its arterial road network with a major toll road. It chose a build, own, operate and transfer (BOOT) strategy for procurement, and it had gone to tender to select a consortium to undertake the work. The main construction contractor in a leading joint venture (JV) wanted to identify the risks it faced in its own activities to improve the quality of its tender. It also wanted to understand how the road authority might perceive the risks, to enable it to take the authority’s views into account in its submission and adopt a proactive approach to managing the authority’s concerns. The project involved the design, construction and operation of a new toll road, to connect an existing highway with another recently constructed high-capacity road. It would form an important link in the urban arterial road network, for both commuters and industrial users. It was intended to reduce traffic congestion, travel time, accidents and fuel use on the existing highway network, accommodate continuing traffic growth and reduce adverse impacts of through traffic on residential roads. Underground construction, including two bored tunnels, a cut-and-cover tunnel and ventilation shafts, formed an important part of the project. The JV consisted of a major construction contractor, a road maintenance provider, a provider of tolling services and a consortium of banks. 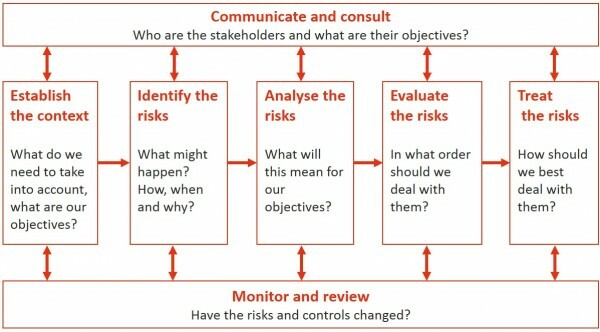 The international standard ISO 31000 Risk management – Principles and guidance (Figure 1) provided the framework for the process. Two risk assessments were undertaken, the first from the perspective of the JV and the second from the perspective of the road authority. The road authority was not involved in the exercise: the JV conducted both assessments, putting on a ‘road authority hat’ for the second one. Stakeholder objectives were reviewed and condensed to sets of criteria for the project, one set for the contractor (Table 1) and one for the road authority (Table 2). Key elements are used for structuring the assessment activities. 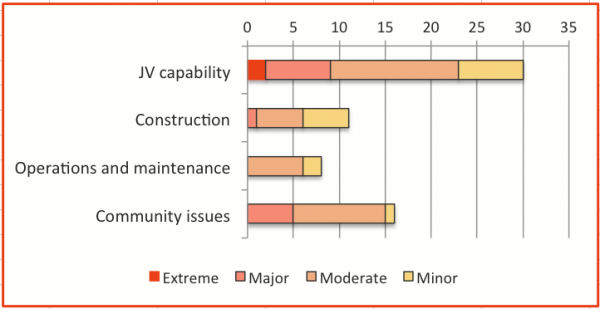 The elements selected in this instance are summarised in Table 3 for the contractor C and in Table 4 for the road authority R.
Figure 2 shows the risk profile for the JV. 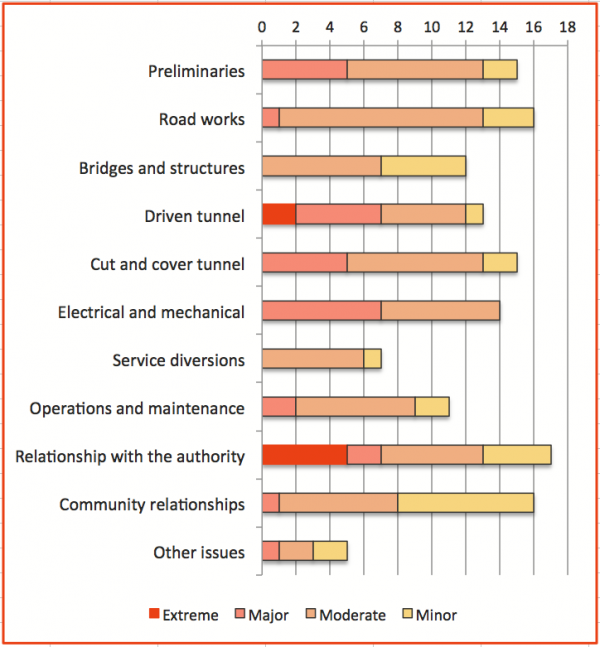 There are some extreme risks associated with the driven tunnel and the JV’s relationship with the road authority. There are a few major risks associated with road works, bridges and structures, service diversions, operations and maintenance, community issues and other issues. The contractor and other JV members felt they had the experience and ability to manage most of these well, and few of them were urgent at this early stage in the tendering process. The risks with agreed ratings of extreme or major all required management attention at a senior level. The JV Project Director undertook to allocate responsibilities after the workshop and develop treatment plans as appropriate for these risks. The capabilities of the specialist contractors and sub-contractors to be used for electrical and mechanical works, particularly in the underground portions of the road. The tender was designed to address these concerns directly and provide evidence that would demonstrate that the road authority could have confidence in this JV and its proposal. The JV’s tender was successful, as was the project. When preparing a tender response, considering the point of view of the entity that has called for tenders can be very valuable, particularly if the evaluation of responses will involve many criteria and trade-offs. For a tenderer, taking a different viewpoint provides insights into the concerns of the project owner that help to develop a better tender response. If the owner’s evaluation team can see clearly that their key issues have been recognised and addressed then they are more likely to be disposed favourably towards the tenderer. However, taking a different view requires more than simply thinking about what the other party might feel. It requires a deliberate effort to enable personnel to put themselves in the place of the other party. Structurally, the criteria and key elements used in the analysis must be adjusted to suit each perspective and focus attention on the key areas of concern of each of the parties, as they were here. The participants in the assessment must consciously adopt another perspective, something that is not easy to do in practice. The facilitator, preferably someone independent of all parties in the tendering process, needs to remind them regularly of the role they are taking and the way they need to look at the world. This is best done in a separate workshop, as was the case here, and preferably off-site, away from the office and in different physical surroundings. Where possible, participants who have worked with and understand the project owner before should be involved in the assessment. This case study describes a risk assessment for an urban toll road, to be delivered as a public private partnership (PPP). Only a high-level view was required, so detailed risk identification was not needed, but understanding was critical. The case illustrates a simple risk assessment process, with an extended risk analysis stage that supported more detailed control assurance. It generated increased confidence and understanding in the project and the work that had been undertaken so far. What can we learn from a new procurement strategy? A government transport agency wished to learn lessons by ‘looking back’ at the tendering process for a recent highway project to be procured as a public private partnership (PPP), an approach the agency had not used before. Two workshops were conducted: one to learn lessons and one with a focus on how risks should be managed in PPPs in the future, consistent with the agency’s established risk management framework. The case demonstrates how root cause analysis can support new or innovative initiatives. This case study outlines a risk management activity that was conducted jointly by a project sponsor and a contractor, shortly after contract signature. The aim was to reduce risk exposures for all the parties involved and generate better project outcomes. There were significant benefits in terms of a deeper understanding and appreciation of each other’s perspectives, as well as a cooperative approach to risk management in the project.